Happy Monday, dear readers! I hope you had a wonderful weekend and geared up for the new week ahead! It was a relatively uneventful weekend for me, but as you probably know by now, I actually prefer the low-key weekends. It was quiet, or at least as quiet as my two little boys will allow, as we get the holiday lights and decorations up. We also went to a nearby "choose and cut" tree farm to get our holiday tree. With the exception of one year, I've always had a real tree in the house, but this was the first time I've actually selected one to cut. It was so much nicer than going to one of my stores and trying to pick from a super wrapped up version and trying to determine how the branches lay when not so tightly bundled! The particular farm and the family that owns it was severely impacted by the Sonoma County wildfires this past October. I've been trying to be even more aware of supporting local businesses over the past few years, and this year seems so much more important than previous years. It may make purchases a little more expensive since the cost of living around me is reflected in the prices, but we're happy and healthy can handle small sacrifices here and there. Now on to today's blog post before I keep rambling away on other things! One of the vendors at The Makeup Show in Los Angeles last month was TEI Spa Beauty. They sell a variety of products, including the fabulous ojo RENEW thermal microcurrent device to treat fine lines that creep up on your face as you age, but my eye drifted to their Diamond Makeup Brush Set sitting on the table. They very kindly provided me with a set of my own and their Silicone Cleanser Mat to try out and review for my fantastic readers. Because brushes often work well with some products but not others, I wanted to thoroughly test these out with a variety of products with differing textures. I used this set, and ONLY this set, for the past four weeks as much as possible when applying the corresponding products for this review. Let's jump in and get a closer look at the set contents and my thoughts about them! 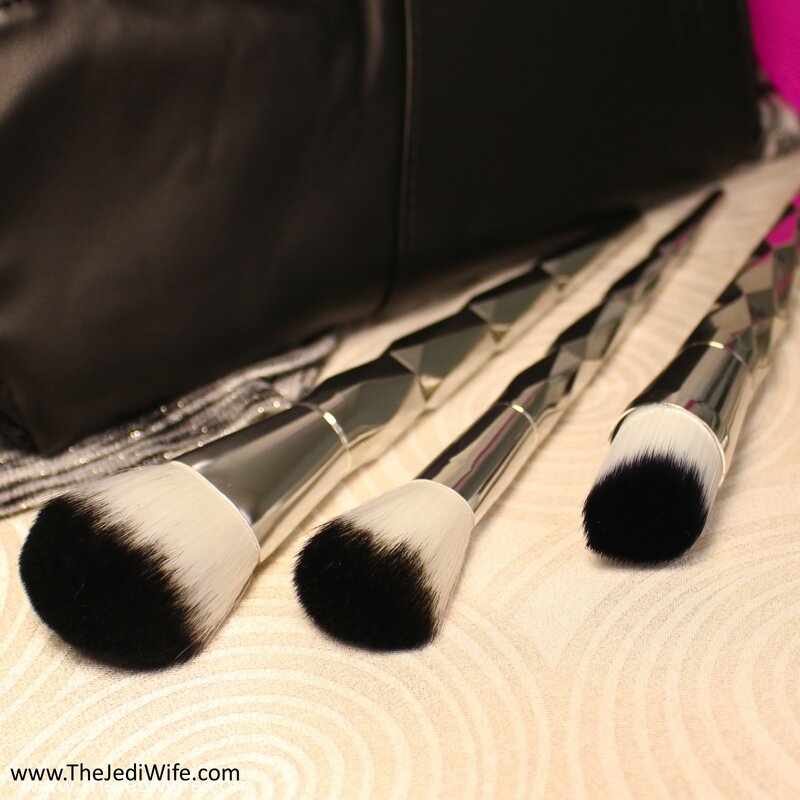 The Diamond Makeup Brush Set consists of five brushes and a zip-up travel pouch. Per the TEI Spa Beauty website, the set includes a contour brush, powder brush, a blush brush, and an angled liner brush. The fifth brush is actually not officially identified on the site, and I tested it out both as a concealer brush and an eye brush just to cover my bases. 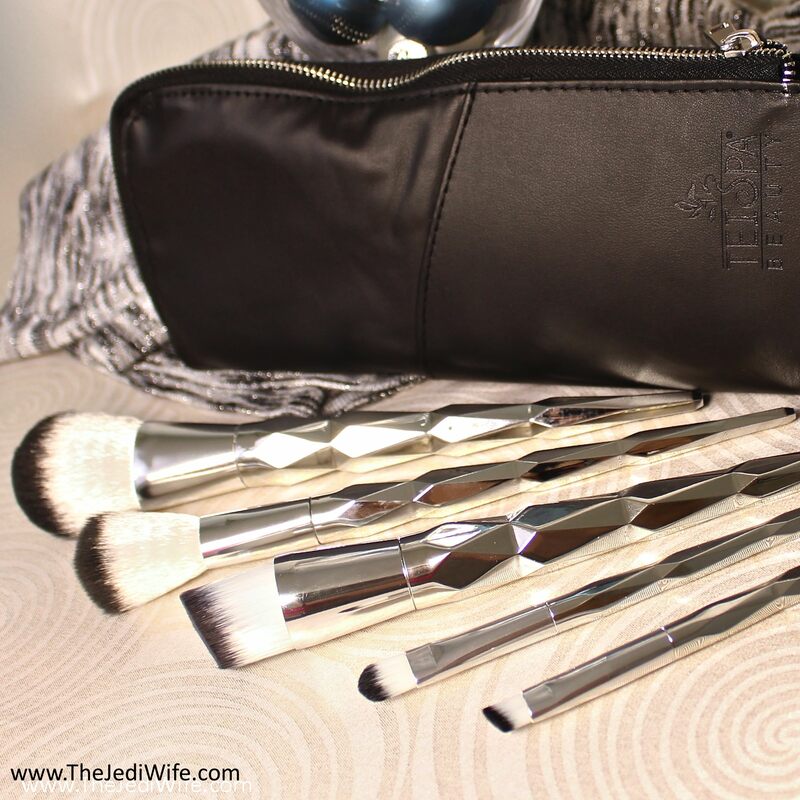 The Diamond Makeup Brush Set also includes a zippered pouch has a nylon interior with a recycled leather exterior. The bottom half of the pouch utilizes firmer leather so that when the unit is opened, the softer top area can fold down and the bottom can be used as a stand for quick and easy access to your brushes. Up until now, my brush travel system has consisted of a roll-up case, and while they have been great as a space saving measure, I wasn't a fan of having to pull brushes in and out for use, and I do not like to just leave my brushes laying on the counter in hotel bathrooms. The ick factor is just too high in the event the counters aren't cleaned as well as they should be, and I do not wanting to be putting that on my face! 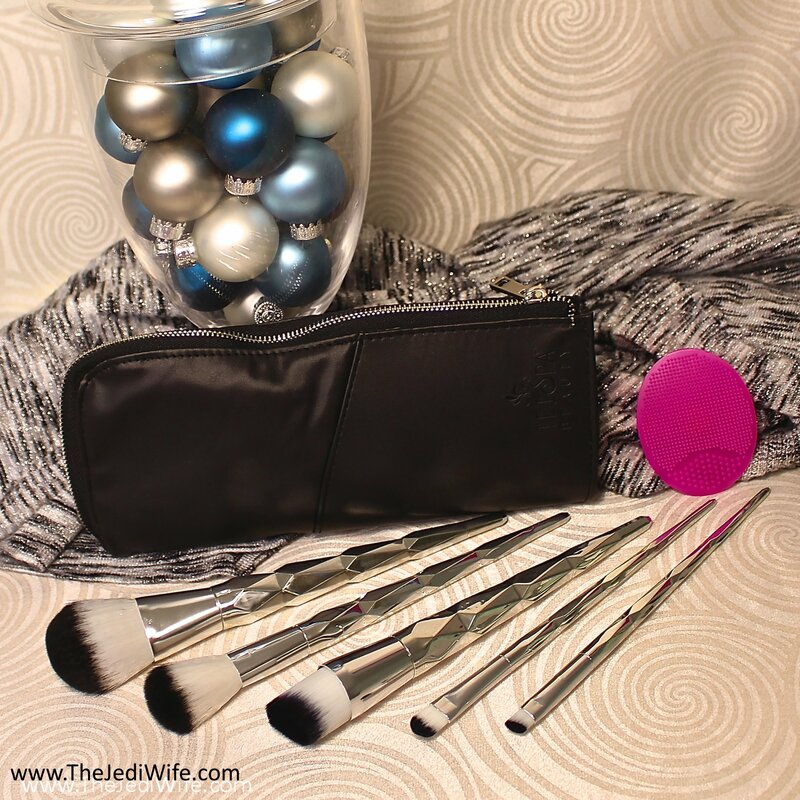 The travel pouch that comes with this makeup brush set is the perfect solution, and I only wish I had it in my life sooner! As for the brushes themselves, I have very mixed feelings about them. To help keep this from just being a long and drawn out paragraph, I'm going to break this up to address each of the individual brushes and my thoughts on them. I will go ahead and start out by saying this brushes are cruelty free and made with synthetic bristles. The contour brush is very dense and picked up my powder contours nicely. The angle suits cheekbones really nicely and made application a breeze. I did have to build up contour with this brush rather than going all out in one go as the dense packing of the bristles makes it harder to soften out the edges. The density also makes for an odd swooshing sound as you're using it on your face. While it isn't a deal-breaker for me, it was something I observed that could be troublesome for those with auditory sensitivities. I used the powder brush to apply my finishing powder, and it blended it in nicely as well as swept off the excess from the few times I opted to bake under my eyes. The downside about this brush is the upper portion of the brush that contains the bristles popped off the handle within the first two weeks of my testing out this set. I have been able to get it to fit back into the handle so I can still apply powders easily although the top part still comes off whenever I do a thorough cleaning of the brush. I'm on the fence as to whether or not I will continue using this brush. While I like how it applies my powders, I don't know that I want to deal with having to fix the handle every week when I deep clean my brushes. I also had the same breaking off issue with my blush brush as I did with the powder brush, only my experience with this particular brush has been worse. The bristle area popped off after about a week of use and I cannot get it to stay securely in place, even when in use. While I have managed to make it work for the full four weeks for this review, I have had to be very conscious of how I'm using it and taking extra care to be gentle during application. Needless to say, I will no longer be using this brush beyond this testing period. As much as I like how it blends out my blushes on my cheeks, I do not have the patience to deal with a brush breaking on me if I'm trying to get my makeup on quickly. The angled liner brush was a pleasant surprise for me. When I first saw this brush, I did not think I would like it as it is wider than my other angled liner brushes that I like, and rather than having an even thickness down the brush tip, it is shaped like a teardrop. On the days I opted to keep my eyeliner simple by just sticking close to my eyelids, I would spray this brush with my setting spray before picking up eyeshadow and setting in place. While I wouldn't recommend this particular brush for fine lines or when you want more control for a wing, it does give a stunning smudged out eyeliner look. With my very hooded eyes, I can never get a wing I am happy with, so a smudged out look tends to be my go to. I'll definitely be grabbing for this brush in future applications! The fifth and final brush has been getting the most attention from me as a flat concealer brush. The bristles are soft and tightly packed, making it a great tool to blend in concealer under the eye area. I personally found this brush to be too wide for spot concealing on the face although those with larger areas that need a little extra coverage may like the larger width over a small pinpoint-type brush. As I mentioned previous, I actually tried this brush for eyeshadow application as well (with cleaning between concealer and eye shadow, of course! ), but it didn't pick up powder colour very well and the brush was too wide for precise placement on my eyelids. If you decide to pick up this brush set, I would just plan to use this for concealer. I was also provided with a Silicone Cleanser Mat to test alongside these brushes. This is not part of the brush set and can be purchased separately if you're not in the market for more makeup brushes. This silicone mat is small at approximated 1.5 x 2 inches, making it the perfect companion for traveling with your brushes. With the two different sizes and spacing of the raised "bristles", this cleanser mat works well with a few drops of your preferred cleaner and water to remove excess product from your brushes. This cleanser mat is a little on the small size so it does make controlled cleaning of larger brushes a little awkward, especially if you prefer to keep your brushes contained to the area of the cleansing mat only, but it works well enough for all the brushes I tested if you don't want to take a large mat with you while traveling. For my own personal use, this works really well for me as I tend to use a sponge applicator with liquid foundations most often so I don't need a mat for that tool. I love that this Silicone Cleanser Mat is the perfect size to wash my eye brushes! What sets this particular mat apart from some others that I have used is the addition of a suction cup built into the back. Once I have finished cleaning my brushes, I can quick rinse it off and stick it to the corner of my mirror so it can dry easily and I can FIND it when I'm ready to wash my brushes again. I've disliked washing my brushes for so long because I've accumulated mats that lay too flat, even with small suction cups on the back, so they never feel like the back dries. With this Silicone Cleanser Mat, the working area is sufficiently raised so it isn't resting in a pool of water, allowing it to dry completely and quickly. I also greatly appreciate that is it made up of environmentally-friendly silica gel, is non-toxic, and that it doesn't exude strong or offensive odors. Part of the reason I wanted to test this set out for so long was to see if I could ultimately decide if I should recommend it to my viewers. In the end, I have such mixed feelings about this set, and you will have to decide for yourself if it is worth it to you. While I do like most of the brushes themselves, I was not happy to have two of them break on me in such a short time. The silver faceted handles are fun to look at, but it is my opinion that they cheapen the feel of this set. If I could focus on just the bristle portion of these brushes and the awesome travel pouch, I would wholeheartedly say this set is worth the $35 price tag. Unfortunately, you do need the handles to get the proper leverage for application, and having two of them break off so soon after receiving them is disheartening and makes me question how much longer it will be for the others to decide to pop off on me. If I were to personally be asked to pay the full price for this set, I would walk away and pick up a different set. The travel pouch and the angled liner brush that I foresee continuing to use the most just isn't worth spending $35 to me. The Silicone Cleanser Mat, on the other hand, is a great tool to have, especially to take in your traveling makeup bag! It is also very affordable, and I could likely find the change hiding in the seat cushions to buy one. Ultimately, only you can decide if these are worth the expense to you, but I hope sharing my experience makes the decision come easily for you, whatever way you decide! Have you tried these particular products before? I'd love to hear about your experiences, be it good or bad! They may not be the best at function, but they are gorgeous brushes. I love the look of the geometric pattern on the handles. I really need to get some new brushes and one of those brush cleaners. I am in need of new makeup brushes! I love the shiny look of the handles. I think I may need to go grab myself some of these as an early christmas gift! I appreciate that you have been supporting the local businesses around you, I try and do the same. Building each other up is something we all ought to do. Also these brushes seem like the perfect gift for my niece who is just getting into make up. Thank you for the honest review. I don't know if I would buy this set but I appreciate the feedback. I wish I could have all the makeup brushes. I don't need them. The brushes are pretty to look at but I think I'll pass on them. These look like some lovely makeup brushes. I need to try that cleanser mat as well! How lovely are those brushes, I really must look to get myself one of those brush silicone cleaners as well as they seem so good. Those brush handles look so fancy! So pretty but it's a shame that they don't hold together. They are pretty but yay for letting us know they aren’t always what they seem! I've never heard of this brand but I love how detailed you are in your review. It really helps when I'm looking to drop some money on the unknown. I have a whole one face makeup brush that I use for blush and highlighter and it's also popped off the handle. I should really just get new brushes! The Silicone Cleanser Mat seems very useful. The brushes looks great. My gf would love it! They are really pretty tho. One thing good to know is that despite the ferrule coming off and all, at least the brush heads are good. Maybe they can up the production quality of attaching them to the handles. These brushes look like they are so great. I am looking for some new ones and might just give these a try. Those makeup brushes are really cute and unique! My daughter will love it! I keep hearing about the silicone cleansers and how great they are compared with the classic ones. Shame that the brushes are not so great and that 2 broke already. I actually want to own one of these brush cleaners. Thanks for the reminder I have to add it as one of my beauty tools. They are gorgeous brushes! Best gift for a friend. These brushes are gorgeous! I am loving the design ! I don't wear makeup so I would have no use of them but a friend of mine would go crazy for them! The brushes are pretty. Too bad they don’t function so well. Thanks for the honest review. Sorry to hear that these were hit and miss. Maybe there's something you can do with the ones that didn't break. How beautiful are those brushes. And I love such brush cleaners. It's a bummer that the brushes weren't better for you, but the handles do give them a really fabulous look! I am in love with these brushes. I am adding these to my Christmas gift for sure!